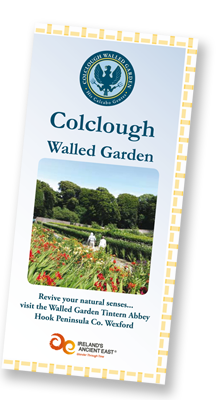 Colclough Walled Garden, Tintern Abbey, Co. Wexford :: Download our brochure for maps, directions, current and historical information. Our current edition of the brochure is available for download in English. Our first edition of the brochure is available in the languages listed below. Download a PDF of the brochure in your preferred language. Irish Translated by John Caulfield. Dutch Translated by Douwe Wipkink. German Translated by Claudia Schüller. French Translated by Gaëlle Giraudeau. Chinese traditional Translated by David Keane. Chinese simplified Translated by David Keane. Italian Translated by Silvia Goria. Spanish Translated by José Gonzalez. Colclough Walled Garden, Tintern Abbey, Saltmills, Hook Peninsula, Co. Wexford, Ireland.